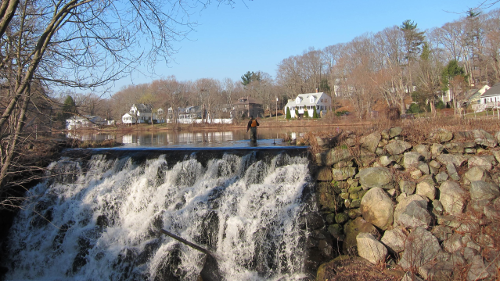 SA inspected and evaluated Shepard Pond Dam, including grouting to test embankment permeability, designed repairs and a labyrinth spillway to pass the 100-year flood, and oversaw dam reconstruction. 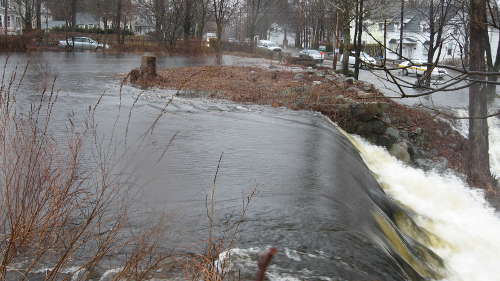 A 150-foot long earth and retained earth embankment dam with a boulder spillway overtopped during flooding in June 2006, toppling a portion of the downstream stone masonry wall. 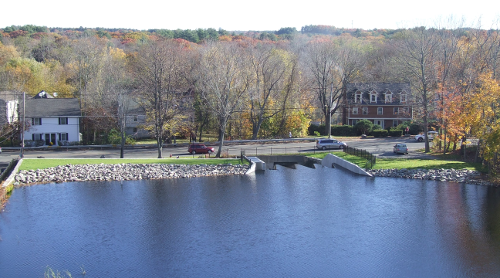 The Town of Canton retained SA to provide an emergency visual inspection and subsequently perform a MA DCR ODS Phase I Inspection and develop options for Dam repairs. 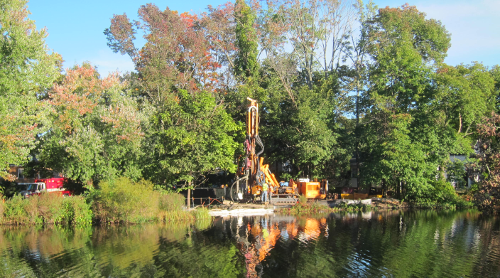 Following Phase I Inspection, SA performed a Phase II Inspection and Evaluation, required by MA DCR ODS, including hydraulic and hydrologic study, stability evaluation, geotechnical borings with instrumentation to measure groundwater levels and pressures, Emergency Action Plan, Operation and Maintenance Manual, and design of repairs to the Dam. 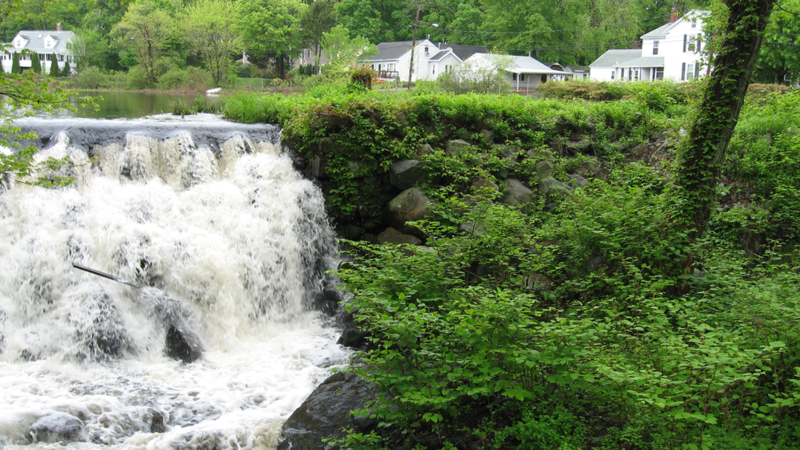 The Dam was an old mill dam that impounds Massapoag Brook, which flows over the spillway and through the Washington Street Culvert/Bridge about 50 ft. downstream of the Dam and underneath Washington Street, a main thoroughfare in Canton. 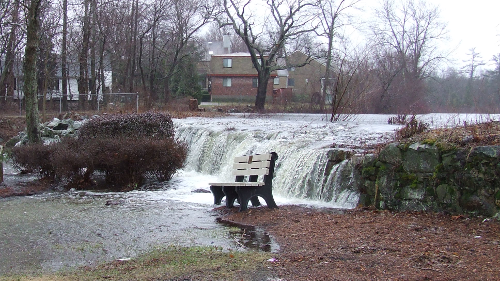 The Dam’s hydraulic and storage capacity were significantly smaller than the 100-year design flood, resulting in frequent overtopping in flows less than the 10-year flood, inundating Washington Street and flowing between downstream residences. 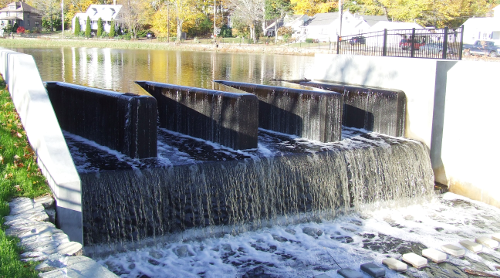 SA designed an innovative labyrinth weir spillway to pass the 100-year design flood with one foot of freeboard without increasing upstream water elevations during flooding (that could have affected upstream structures) and without significantly increasing the footprint of the Dam. 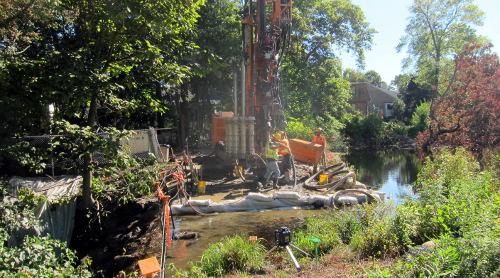 To mitigate subsurface seepage and address subsurface voids identified in the borings, SA designed a grouting program consisting of low- and high-mobility grouts to be injected in the foundation and embankment, combined with replacing the top 7 ft. of the embankment with engineered fill. SA completed design plans, specifications, construction contract documents, and secured permits. 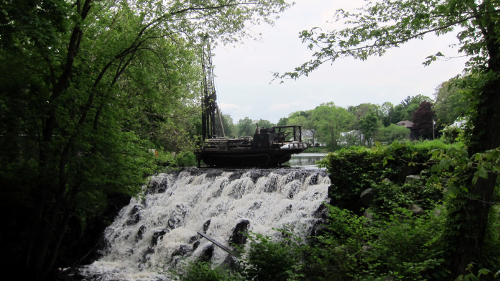 SA also prepared a grant application to the newly-formed Massachusetts Executive Office of Environmental Affairs Dam and Seawall Repair or Removal Fund, and secured $1M in grant and low interest loans from the state, which was the largest award issued in the first year of the program. 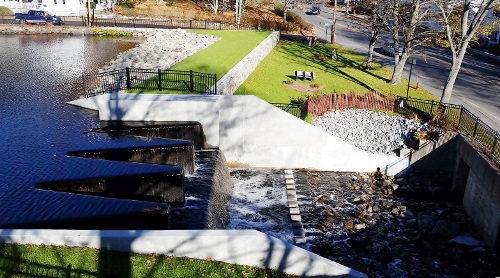 The repairs transformed the old mill dam to a modern engineered structure. 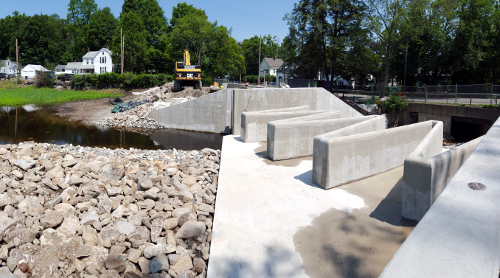 A nationally recognized specialty grouting contractor performed the grouting under SA, and with full-time SA oversight, as part of final design to test the embankment permeability with water and grout, reduce permeability, and fill voids to reduce seepage. 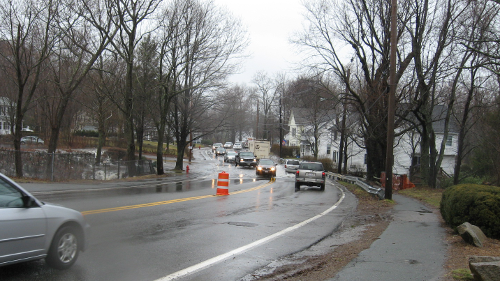 SA administered the construction bid, reviewed the bidders and assisted the Town in its selection of the contractor. 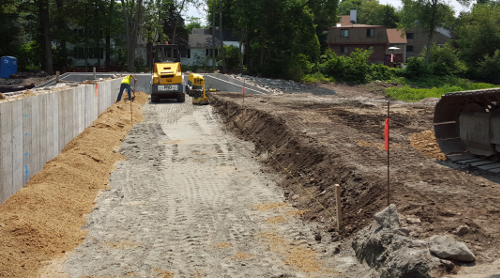 SA observed construction on-site full-time as resident engineer and administered the construction contract, measurement, and invoice review and recommendations for payment on the Town’s behalf. Construction was completed with less than 3 percent overrun of the general contractor's bid price, well below typical industry projects.